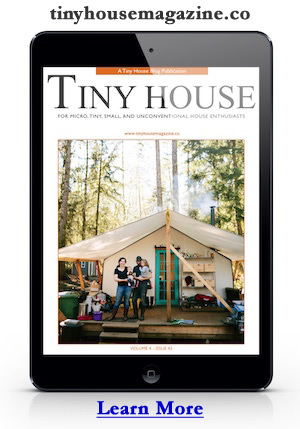 Now that the publicity campaign has begun we’re getting more information and photos of these innovative tiny homes. The three SCADpad prototypes are tiny house designs that reclaim parking spaces in multi-level parking garages that are getting used less and less. It seems a growing number of people are choosing to commute less – opting instead to live closer to work & school where they can leverage the walkability of denser urban neighborhoods, as well as alternative & public transportation. The homes were developed by large cross-diciplinary teams of the folks from Savannah College of Art and Design (SCAD). Each house is just 135 square feet and decked out as art-pieces themselves. They are also filled with arts & crafts made by SCAD students, alumni, and faculty. For example, the floor in at least one unit is made from reclaimed school rulers. In addition to all the art, you’ll find plentiful industrial design items and high-tech home automation tools like a touch screen that controls window privacy settings. In an attempt to teach occupants new sustainable habits, like reducing waste, they’ve removed the trash can and replaced it with just a recycling bin – maybe more of a statement and idealistic idea. But a nice idea nonetheless. To handle biodegradable kitchen waste they’ve included a vermiculture (worm) composting system. The worms break down table scraps quickly and produce a compost tea that can be used to fertilize the occupants’ community garden. Water for the garden drains from the shower & sinks and flows into a grey water filtration system. The garden is located within the cluster of tiny homes. Lighting for the garden growing inside the parking garage comes from an experimental fiberoptic system that brings daylight inside without the need for additional electricity. To learn more about the project visit the SCADpad website. This entry was posted in Uncategorized and tagged art, artist, designer, micro house, SCAD, SCADpad, student housing, urban. I LOVE these. As an artist myself I often have my own (and other’s) art on the walls. I LOVE the idea of the walls ‘being’ the art! The ruler floor had be a first glance! I couldn’t imagine living under cover like this, but I come from NZ where very few people have to live in apartments etc. I will be following along with interest!